I made this cake for our birthdays (a day apart, so it happily served 2 purposes!). *A full guide, with recipes and tips on making various cakes, including the Victoria Sandwich cake that I used in this case, can be found at my key cakes post here. I went for three layers of cake here, using 4 large eggs and the all-in-one method. I just added the grated zest of 3 lemons and a teaspoon of vanilla bean extract to the mixture. This amount gave a good depth of sponge in the 7″ layers. To get the effect I wanted, you first crumb-coat the cake with a thin layer of the lemon buttercream and chill fully so the buttercream firms up. 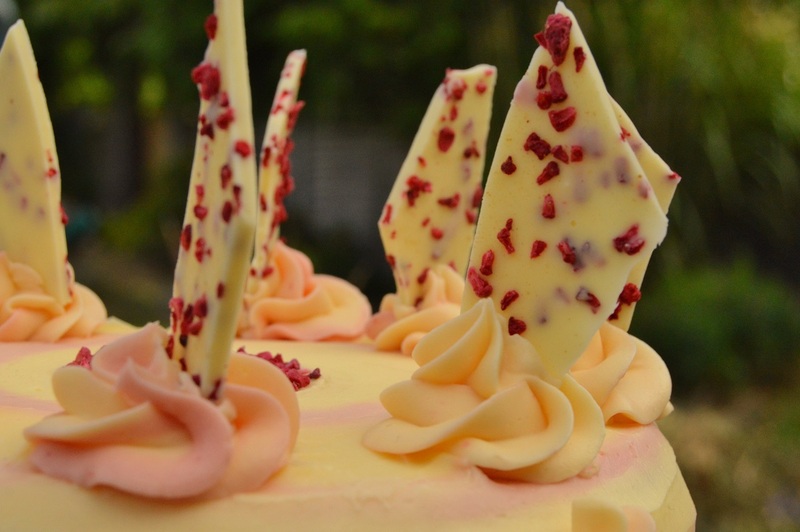 You then simply spoon or pipe alternating bands of the lemon buttercream and strawberry buttercream all around the cake. This is easier putting the cake on a turntable, I went for thicker bands of the lemon buttercream than the strawberry. 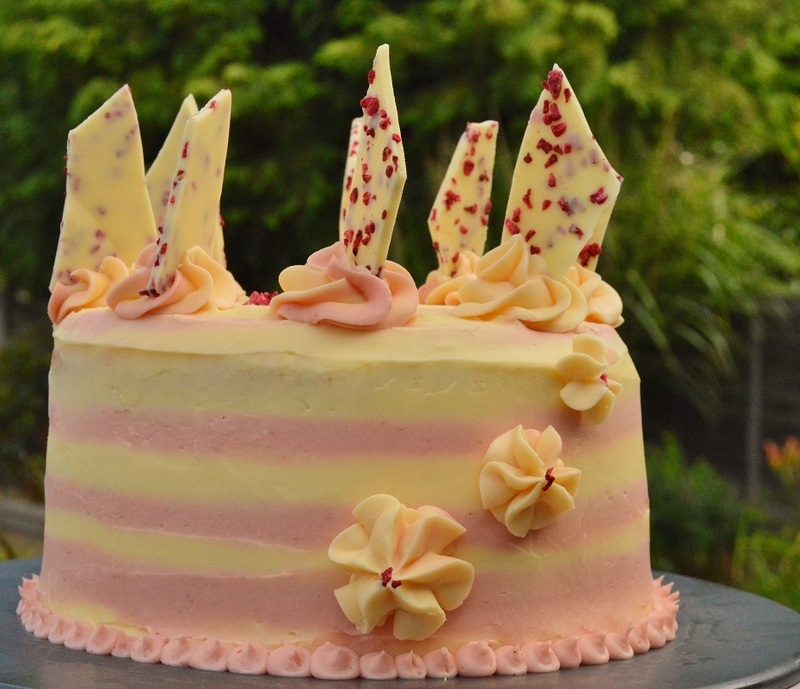 You then hold a palette knife or ruler vertically against the cake, only gently pressing onto the buttercream, and rotate the cake to give a smooth finish. You can go round again if you want. You then chill the cake. I am not a fan of the sickly sweet buttercreams that taste of little other than sugar, so when I make buttercream I reduce the amount of icing sugar: so rather than go for twice the amount of icing sugar to butter, I go for no more than equal quantities of each. Not only is the buttercream leas sweet, yet still unctuous, the other benefit is that this gives you a lighter, more mousse-like buttercream. 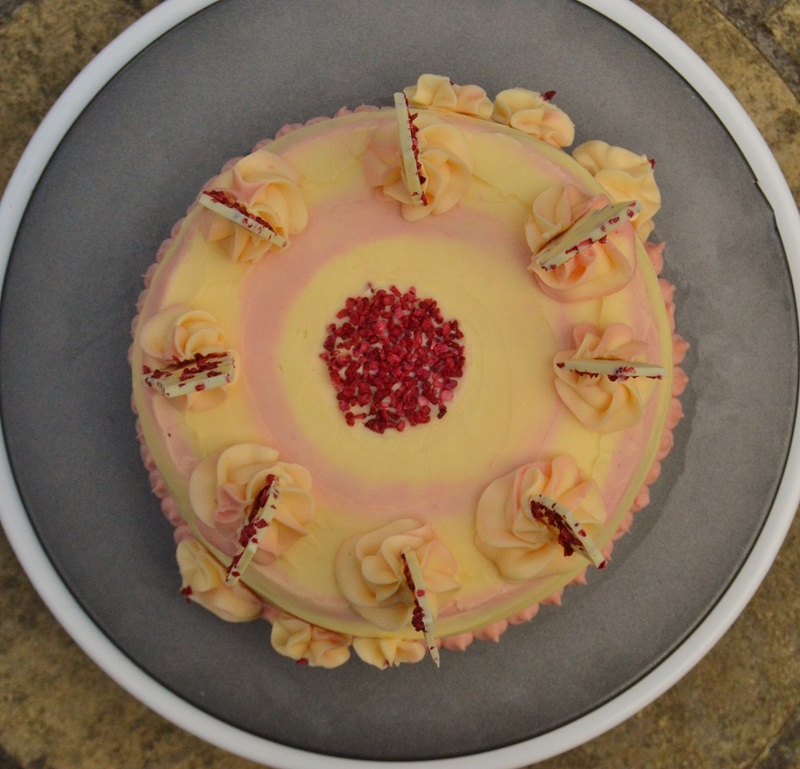 As I often do, I beated in some melted white chocolate into the buttercream: not only do you get that wonderful flavour of white chocolate, it acts as a stabiliser so that you can add more flavour to the buttercream without it splitting: in this case, lemon curd and fresh strawberry purée. The final buttercreams are certainly rich from the butter (they need to be! ), but they are also very tangy from the lemon and the strawberry. (1) You simply best the butter and icing sugar for several minutes until it is very light. Add most of white chocolate and beat in for another minute or so. (2) I took about a third of the butter cream and beat in just over half of the strawberry purée with the rest of the white chocolate, adding a little of the purée at a time until fully combined. The rest of the buttercream had the lemon curd beaten into it. NB: the remaining strawberry purée was spread over the cake sponges before adding the buttercream filling. White chocolate shards: creamy and tangy! The white chocolate and strawberry shards are simply melted white chocolate poured ovnto a sheet of baking parchment. You then sprinkle over dried strawberries and let them sit on top, gloriously suspended in the chocolate. Once the chocolate had set, you just snap them apart. Thank you, Sally. It is actually deceptively easy to do once the cake and the buttercream have been made. I know that you have said what you actually did, but is it possible to have a proper recipe for this unless there is one and I am missing it somehow? Including the buttercreams please? It looks delicious. Hi, I have added more about the recipe. There is a link in the post to my main recipes post for the Victoria Sandwich cake, although I made a similar cake a whike ago with a whisked sponge, which was very nice. Kind regards. Thank you! I know what I am going to be doing this weekend!